Credit Cards, Promo E-mails, and Mailings! Oh My! Let’s talk about the biggest trap around these days…Credit cards! Now, I’m not saying its a complete trap, but much like life vests in the water, credit cards give you a false sense of security, and in this case, money. No matter how much money you make each week from a job, credit card companies will target you for everything you’ve got. Use your card for a purchase, but pay off the amount ASAP. Don’t wait until the end of the billing cycle. Why? Most of the time, you will reach for a credit card if you are short on cash. I do it too, and together we can stop this nonsense! On top of that, credit cards will give you a minimum payment each month. Most of us busy folk pay the minimum and go on with our daily lives. DON’T DO THIS! After each month, most cards have interest for an unpaid balance. So basically, your credit card is a ticking time bomb that increases in a balance just because you aren’t spending or paying off a balance wisely. I like to think each time you click on an e-mail, a marketing employee for that company laughs manically. These people are marketing geniuses! That catchy e-mail titles, the amazing colors, the pretty pictures…anyone can get sucked in…right? My advice? 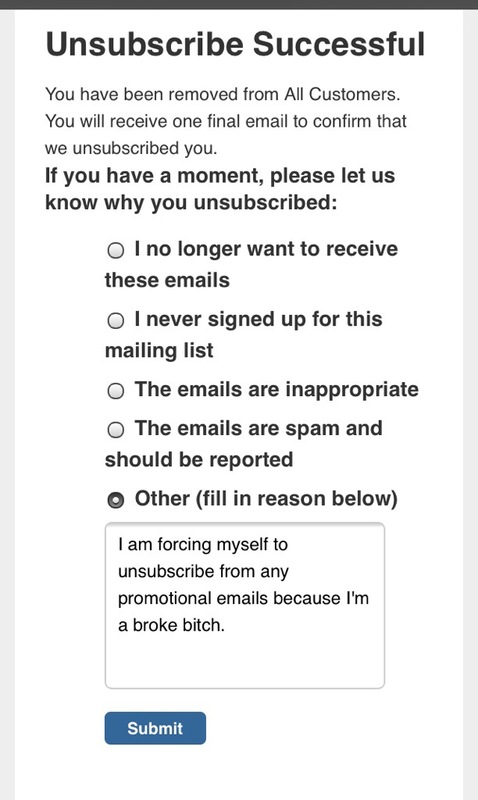 Get it together and unsubscribe. My friend and I recently went through our e-mails and purged our accumulated promo e-mails. Since I last wrote this post, more e-mails piled into my inbox to try and tempt me. Did I give in? Obviously. I have a weakness for Rebecca Minkoff! Don’t judge me! As for mailings, refuse a mailing address when purchasing in a store. It’s for your own good. Sales people will try and convince you otherwise. Listen to me: no. You aren’t being rude, you’re helping yourself. Back to a clean slate tomorrow. Be strong, saving beauties!